Perfection does have an address at 316 Stonebrook Farm Way, Greenville, SC. 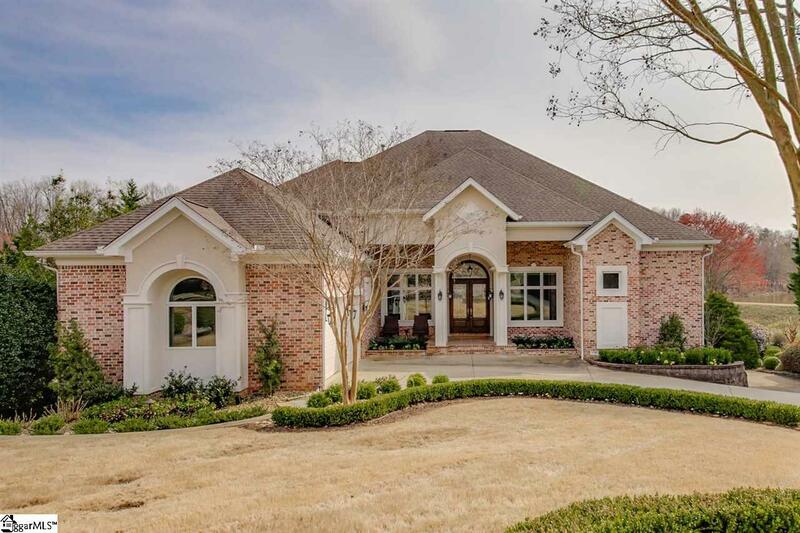 Prepare to be enchanted by the combination of the Owner/Architect&apos;s personally designed home which was created to take full advantage of the gorgeous lake views at every turn and the Current Owner&apos;s flawless taste in design and decor. This prestigious 5 bedroom 5 1/2 bath home has been recently remodeled with the best that money can buy. You will fall in love with the round rooms, scenic views, open floor plan and ease of living. The main level of this awe-inspiring home includes a great room, dining room, kitchen, breakfast room, keeping room, sunroom, wrap around screen porch, laundry room, 2 fireplaces, a home office, a 2 car garage (2 more on lower level), the master bedroom and a guest suite. Upstairs, you will find a loft, a bedroom suite and a lake viewing balcony for the telescope viewing advocate. The basements offers a personal home gym, media room, 2 more bedroom suites, another 2 car garage and storage galore. In 2015, the new owners installed ceramic tile throughout the lower level. In 2016, the kitchen was completely redesigned with Val Dorcia granite (level 6), custom cabinets, panel covered Thermador 30" column refrigerator and freezer, Thermador gas range and hood, Sharp drawer microwave, full slab island with storage and pantry with pull out shelves. Also in 2016, the master bath was remodeled to include a very large glass enclosed double shower, his/her water closets, two vanities with Val Dorcia granite and bowl sinks. At the same time, the main level guest bathroom was completely remodeled to include a lovely walk-in shower. Custom cabinets were installed in the master bedroom & guest bedroom closets. Motorized drapes were added to the master bedroom for ease of operation. In 2018, the sunroom was enlarged with HVAC added and the upper deck was refinished & screened. Along with this fabulous home, you will enjoy a 1.81 acre lot that backs to trees and resort-style amenities in the neighborhood that include Gated entry, large clubhouse, pool, tennis courts, playground and recreational areas. The neighborhood is convenient to GSP Airport, Woodruff Rd. & Pelham Rd. shopping and restaurants. This is truly a home DREAMS are made of. Make an appointment to see it soon.